Allison needed to get some steak tips for her upcoming camping trip, so I went with her to McKinnon's in Davis Square. I perused the meat selection and saw marinated lamb riblets. I had never heard of this cut. A quick Google search explained that lamb riblets are cut from the boney end of the lamb breast rib. For $4 a pound, I decided to give it a try. Most of the recipes I found involved low and slow cooking; but there was no time for that, so I got a nonstick fry pan screaming hot, seared it on both sides, turned down the burner and cooked till it reached a medium rare temperature. It was outstanding. 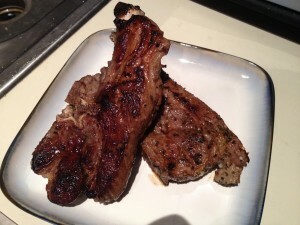 The meat was flavorful from the marinade and although it had a bit of chew, it was not tough. I think the riblets would also be excellent on the grill. Why pay $12 a pound for rack of lamb, when this is a third the cost and packed with flavor?